The uniquely central location of the falcotentorial junction fistula leads to equally unique vascular arrangements and adaptations. As with the vast majority of dural fistulas, the key concept is a single hole nature of the fistula. Nearly all dural fistulas consist of a single hole or, maybe, a small multi-hole region of AV communication — no matter how “busy” the area may appear. Recognition of this concept allows one to selectively target a small key area where the disease sits, in preference to extensive embolizations which use up large amounts of embolic agents, exposing the patient to more radiation dose and, not infrequently, the hazard of multi-stage procedures. 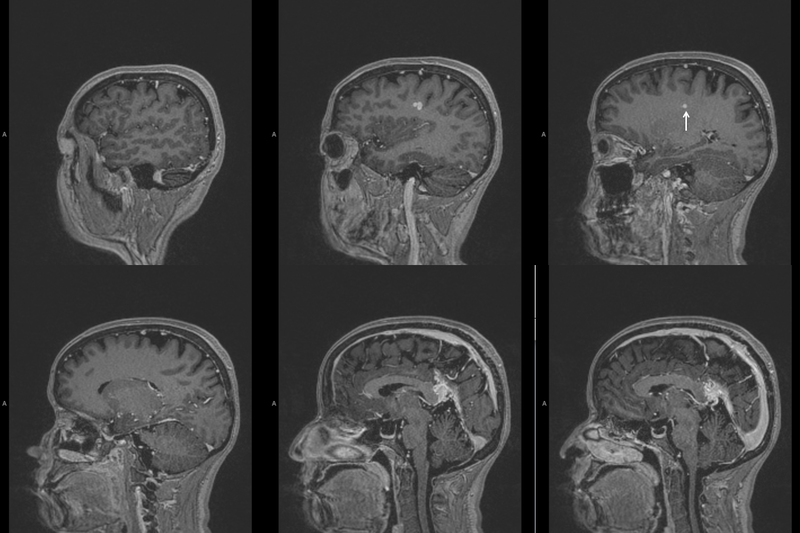 This patient presents with headaches. Notice pulsation-related artifact at the level of the falcotentorial junction (blue arrows) and a markedly enlarged venous structure in the left centrum semi-ovale. Stereo views of arterial and venous phases. The venous phase shows that the basal vein empties via deep sylvian veins into the cavernous sinus — see Deep Venous System and Cavernous Sinus pages for more info. Essentially, the basal vein often does that anyway. 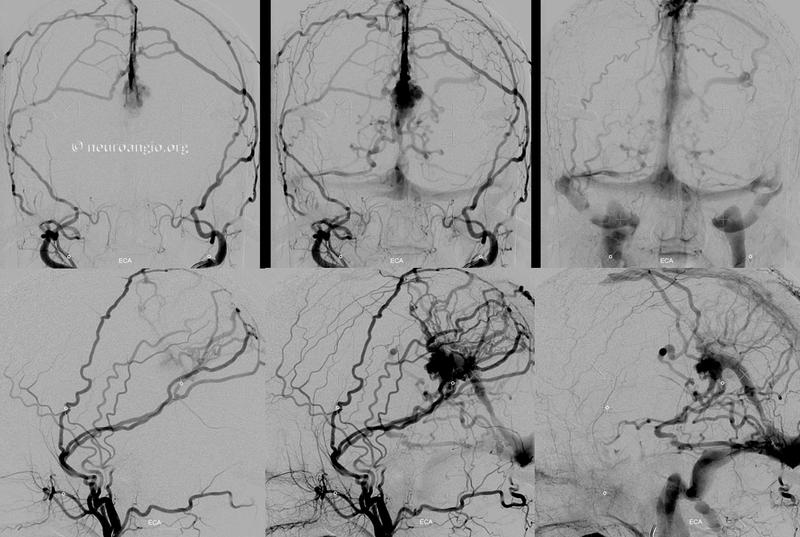 The remarkable thing here is how the internal cerebral vein is draining — it is difficult to appreciate this without stereoscopic projections, because of the superimposition of the Labbe and Internal Cerebral Veins. Stereo projections, however, show that the internal cerebral vein empties, via the septal vein, into a medial lenticulostriate vein, and then joining the deep sylvian (middle cerebral) veins into the cavernous sinus. Pretty amazing. If you can’t believe it, i suggest learning stereo, if you can, so you might be able to see it better. Here is a non-stereo lateral view, showing the above. 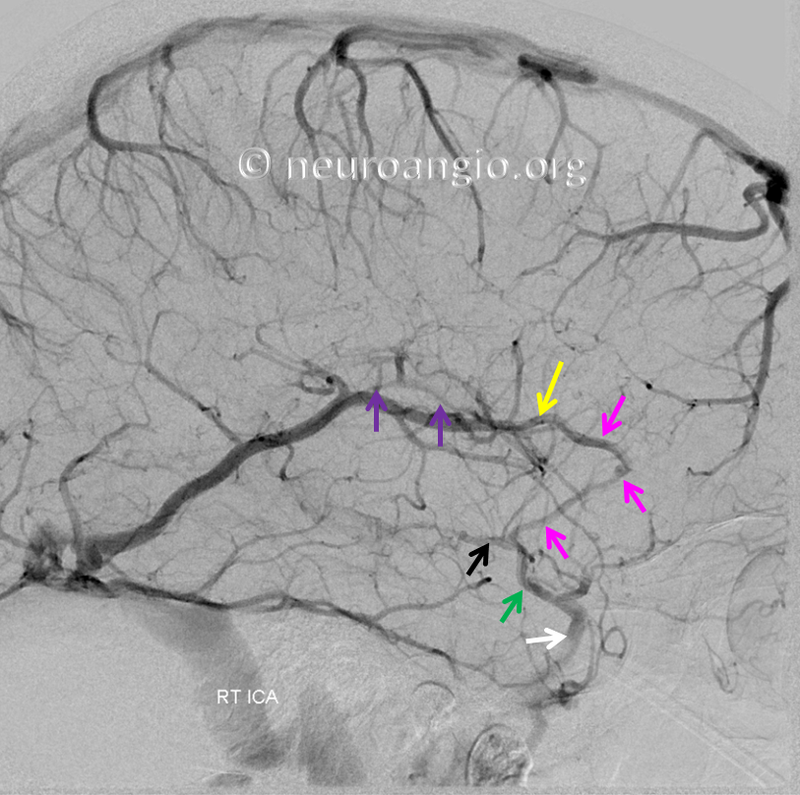 The thalamostriate vein is purple, the septal vein is yellow, medial lenticulostriate vein is pink, basal vein is black, middle cerebral vein is green, and cavernous sinus is white. Without stereo projections, it is really hard to tell this apart from what looks like superficial sylvian veins connected to the Labbe — however this is a fakeout — trust me on this one. What has happened is that the internal cerebral vein has found an alternative outlet, and is no longer using the Vein of Galen — a remarkable feat of adaptation. 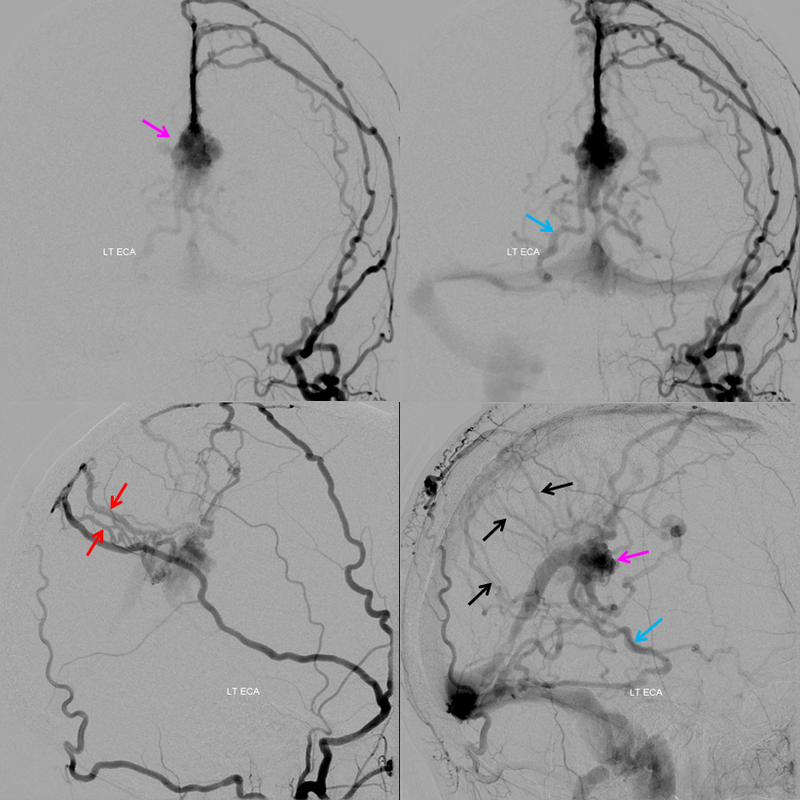 Injection of the right ECA — multiple middle meningeal (orange) feeders into the fistula (purple arrow marks the venous pouch at the site of fistula), via a network of unnamed arteries within the falx cerebri (red arrows). Venous drainage of the fistula proceeds into the straight sinus and via the posterior portion of the basal vein into the right superior petrosal sinus (not labeled). 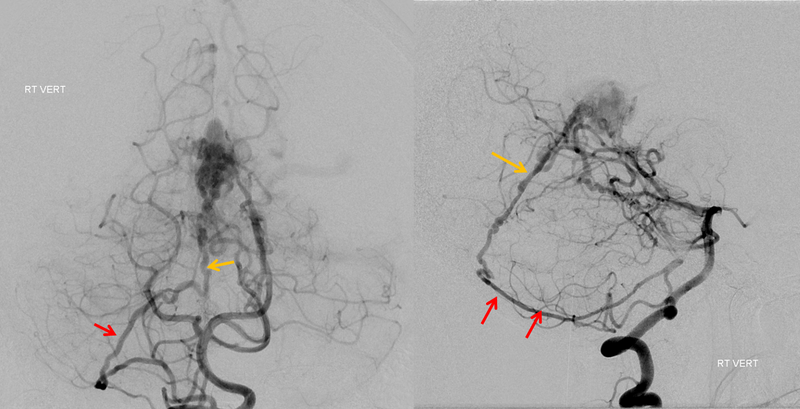 Also notice drainage via the transmedullary vein (white). It is critical to understand that there is only one fistula — in the region of the Galen, marked by pink arrow. The vessels in the falx (red arrows) are arteries which supply it, not veins. Injection of the right vertebral artery (straight PA view) shows supply via the posterior meningeal artery (red) into the artery of the straight sinus (yellow) — fistula venous pouch is pink again. 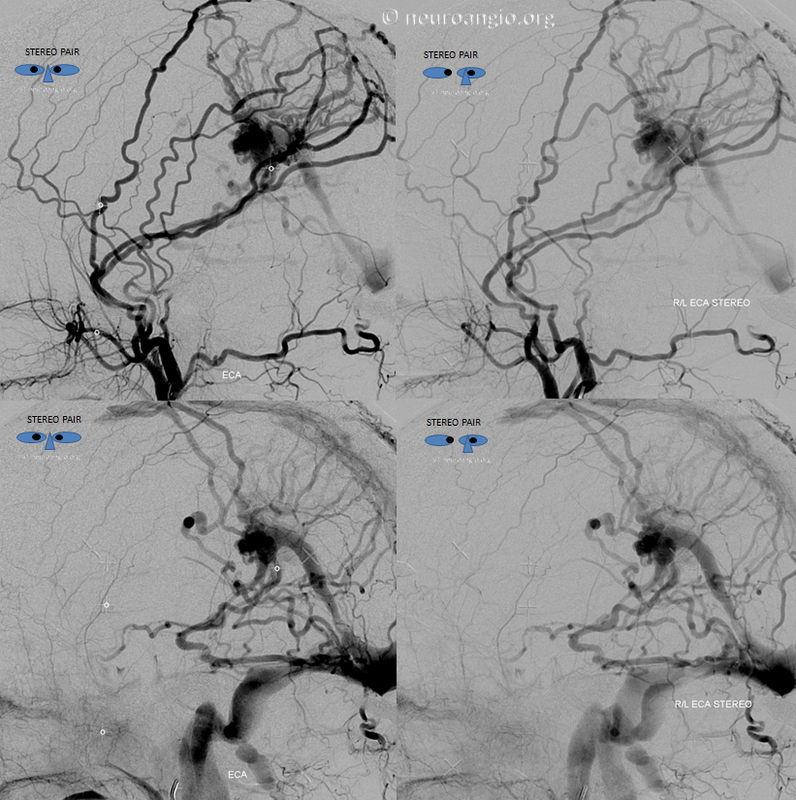 Left external carotid injection — beautiful images. 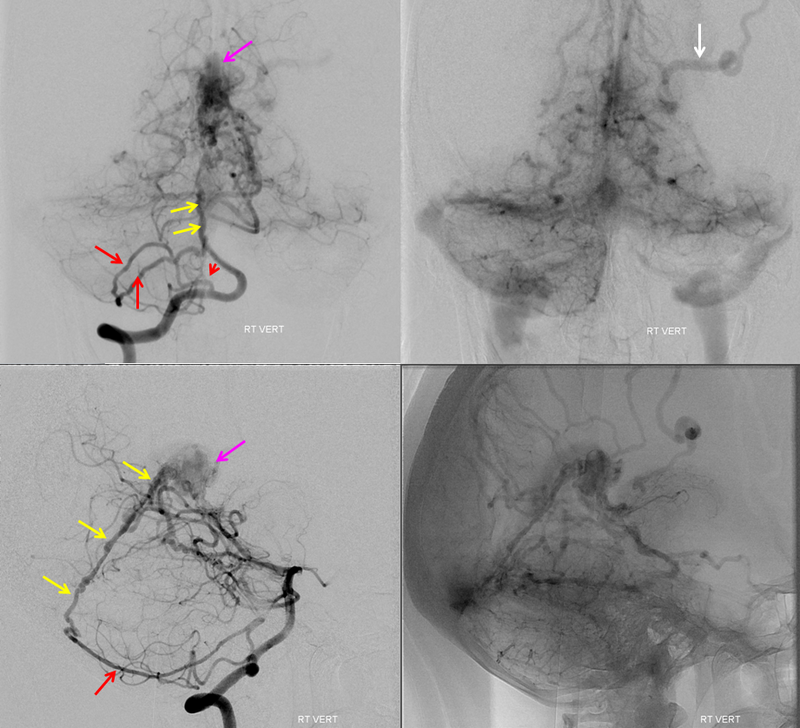 Middle meningeal artery supplies the fistula (pink) via multiple unnamed arterial pedicles within the falx cerebri (red arrows). The same pedicles were seen from the right ECA injections, and show evidence of unopacified inflow by their less concentrated appearance compared with the MMA branches. 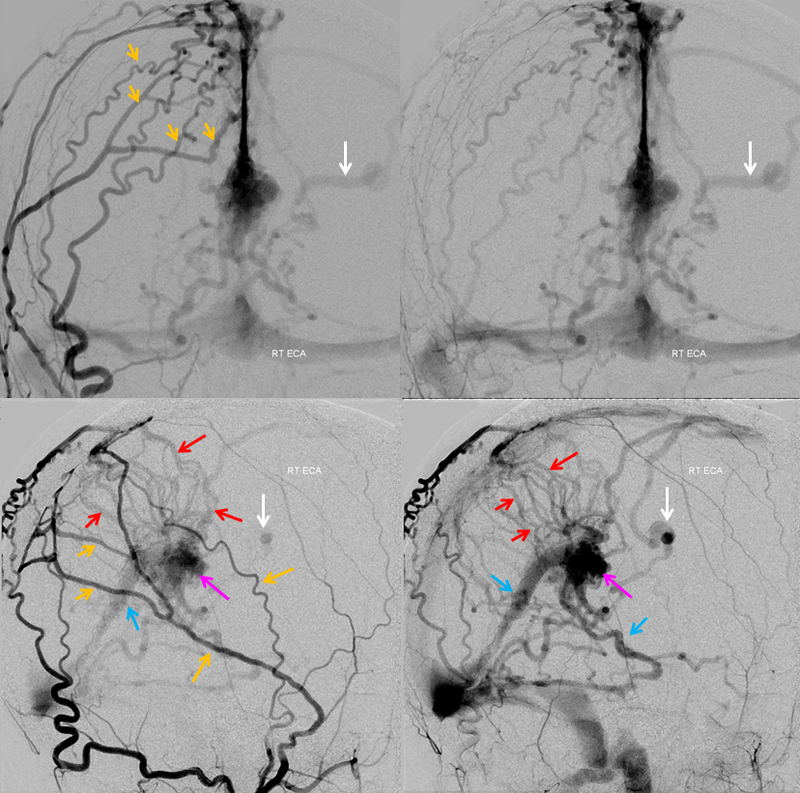 Venous outflow is conducted into straight sinus, multiple posterior fossa veins, including the posterior portion of the basal vein (blue), and, most importantly, into venous channels within the falx cerebri (black). Notice that these channels are not the same as the arteries which supply the fistula (red). Both veins and arteries are seen running along the falx cerebri. The venous structures likely have the same origin as the falcine sinus — and probably should be called falcine sinuses also. The super-important left ICA injection. Again, the posterior portion of the basal vein, vein of Galen, and straight sinus are not seen in the venous phase. 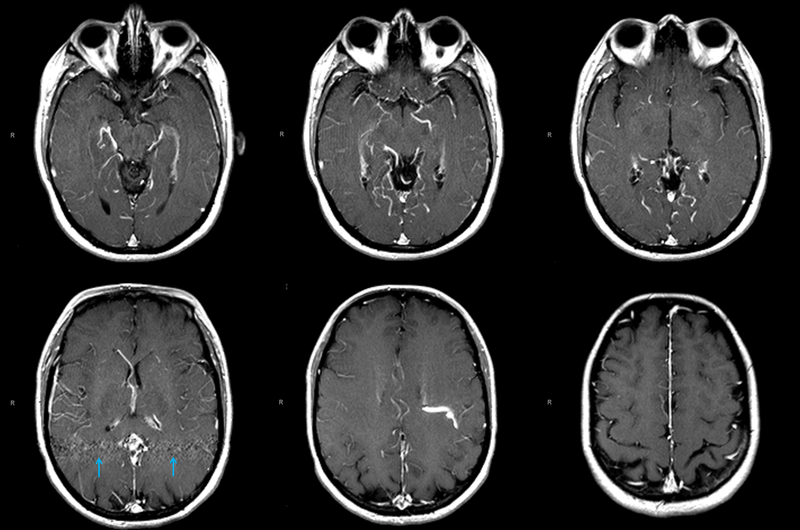 What is seen are medial lenticulostriate vein and transmedullary vein draining the internal cerebral vein. This is a critical observation, because it shows that the transmedullary vein is used by both fistula and normal brain. Spillage of embolic material into this vein could be catastrophic, leading to left internal cerebral vein territory venous infarction. 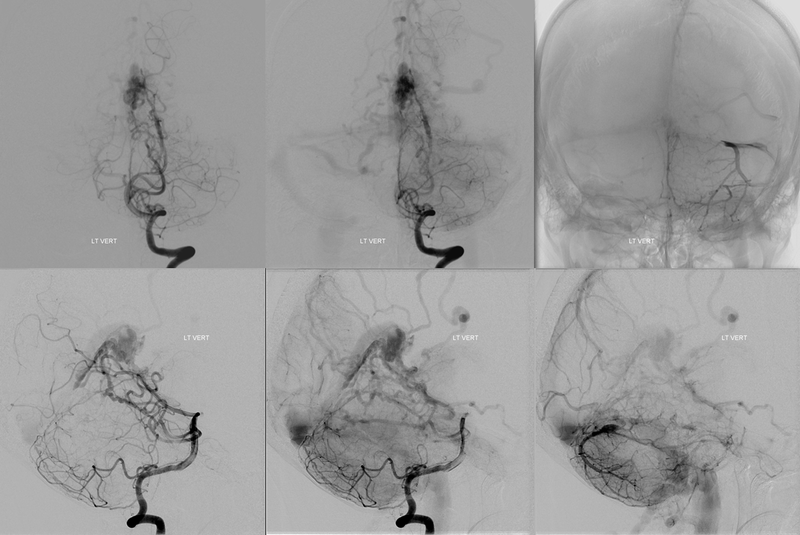 However, since the Galen and straight sinus are not seen in the brain venous phase on any injection, these normally indispensable structures can in fact be sacrificed — coiling off the venous pouch would take down the fistula without endangering the brain. 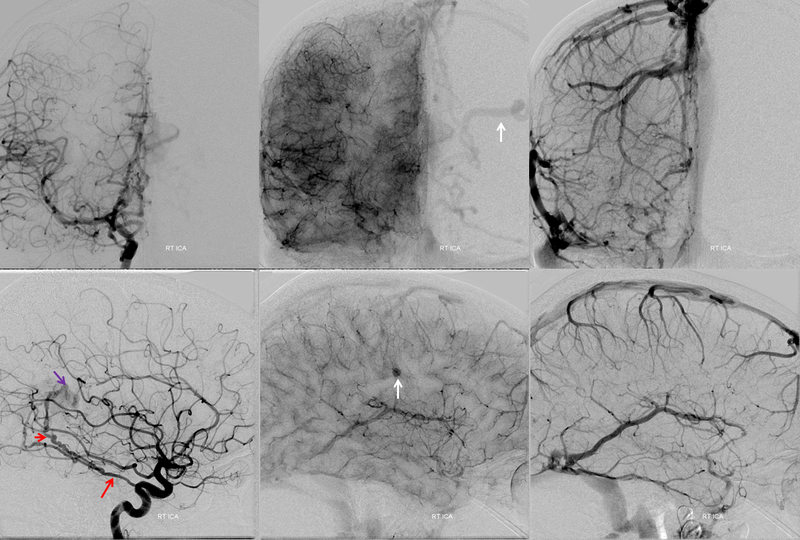 Treatment options include embolization — in this case transvenous coiling of the fistulous venous pouch marked by pink arrows in the images above, or Gamma Knife. In this case, we chose Gamma Knife. Below are bilateral ECA injections, to best demonstrate the target — the round venous pouch. 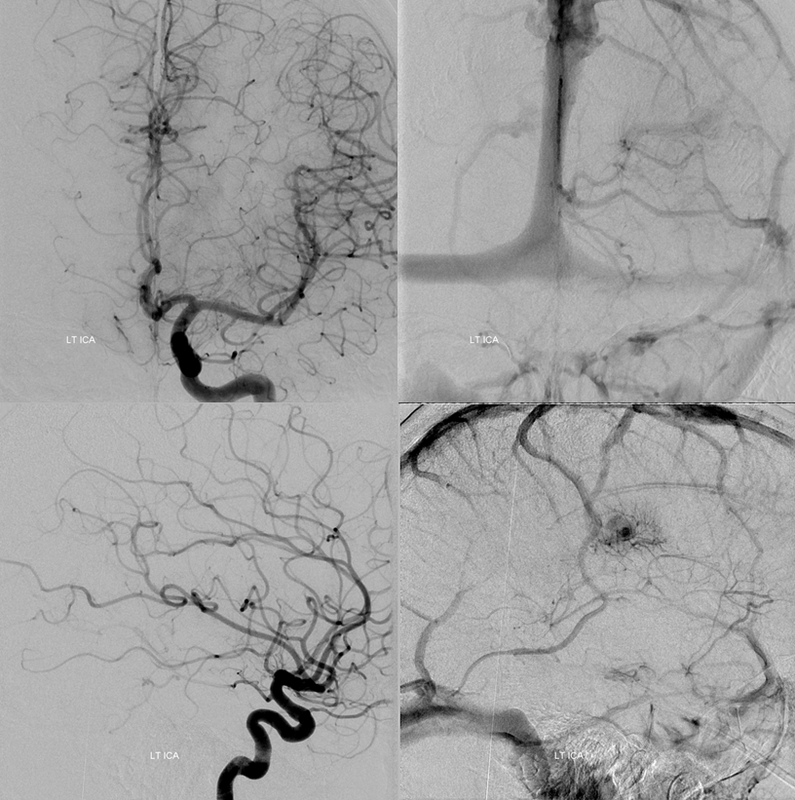 Conclusion — falcotentorial fistulas are great cases to demonstrate arterial and venous structures of the falx and the adaptive flexibility of even the most critical venous drainage structure — the internal cerebral vein. 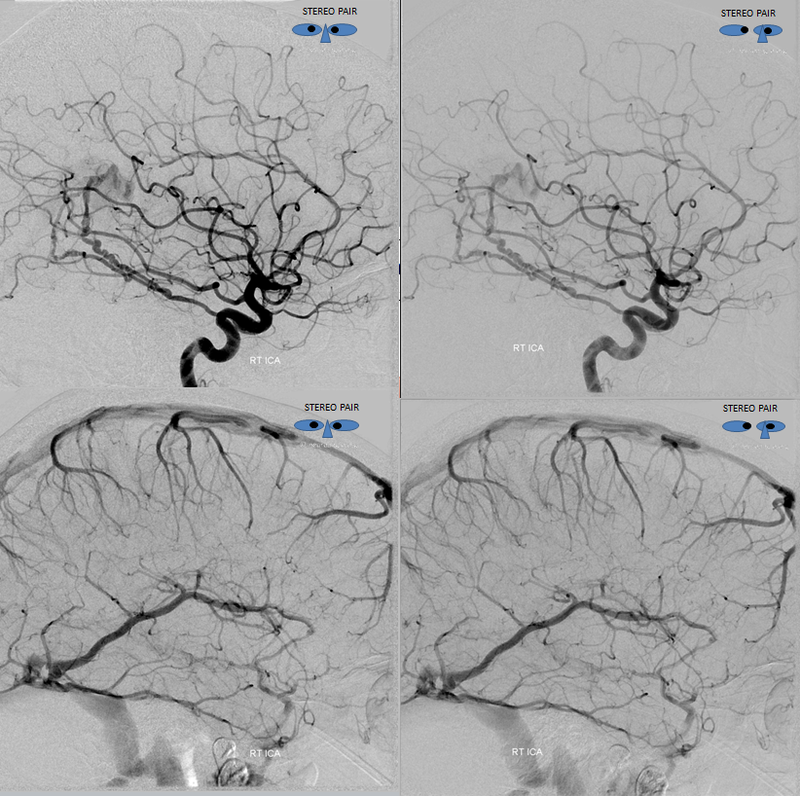 Careful analysis of the angiogram is extremely valuable in coming up with a rational treatment strategy.